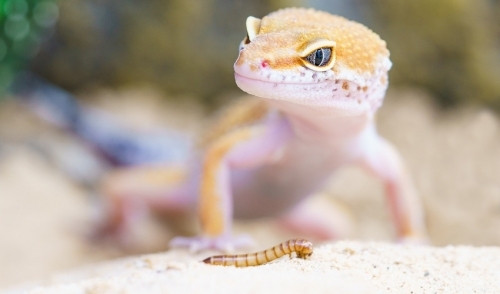 Share "5 Great Beginner Pet Lizards"
Lizards can be fascinating pets for all ages, but they can also be tricky to care for properly. Choosing a lizard that is suitable for beginners is essential for a happy, healthy pet and a positive experience owning your very first lizard. What Makes a Lizard Good for Beginners? Popular and Familiar – The more widespread a lizard is in captivity, the better understood it will be and the easier it will be to learn more about the pet and get help when needed. Smaller Sizes – A smaller lizard will require a smaller habitat and generally less expensive care. Beginner lizards should not be so small that they are too delicate to handle, however. Hardy and Healthy – Lizards that are less prone to injuries and illnesses are best for amateurs to keep as pets, as the lizards will be more tolerant to withstand inexpert care. Easy to Handle – It is always necessary to handle a lizard occasionally, such as when a tank needs cleaning. Good beginner lizards won't mind regular handling and won't typically bite. Full of Personality – A good pet will be fun to own, entertaining to watch and a pleasure to interact with. Several types of lizards have all these traits and are ideal for beginners. Despite their fearsome appearance, these exotic-looking lizards are generally friendly and gentle. They are found wild in Australia but are widespread worldwide because of their popularity as pets. They grow to a medium size and are not too delicate for regular handling, making "beardies" a good pet choice to show off all the best characteristics of lizards. Slower than typical geckos and lacking the sticky pads that can make escapes easy, leopard geckos come in different colorations and marking patterns. These are relatively low-maintenance lizards, and become more docile with age rather than getting aggressive as they reach sexual maturity. They have easy dietary requirements and are easy to clean up after. These are somewhat larger lizards but their distinctive tongues make them a favorite pet. They are native to Australia and Indonesia, and are generally sluggish and very easy to handle. They do require a varied diet, however, and because they love to dig and burrow, a larger, deeper tank will be necessary to provide the best possible habitat. Originally from New Caledonia, these lizards, with their spiky eyebrows, are a slower gecko variety but they do climb and will need plenty of vertical space in their tanks. They are low maintenance and need no special lighting, and they thrive at room temperature. They tolerate handling quite well and are a fun choice for any gecko lover. There are several species of uromastyx, or spiny-tailed lizards, that make good beginner pets. These lizards are native to Africa, the Middle East, and India, and they enjoy handling. Their almost exclusively vegetarian diets make them easier to feed, and because they are active during the day, "spinytails" make great beginner pets. While these lizards are best for beginners, it is also important to note that every lizard, even an "easy" species, has special requirements and needs proper care to live a long, healthy life. Before choosing a pet lizard, it is essential to research the exact needs of that species to be sure you can provide it a safe, comfortable home, nutritious diet, and good veterinary care. When you're prepared for a new pet, any of these lizards can make a great addition to your menagerie.